Ed Clayton is a liar. It started when his dad went to prison and now he can't seem to stop. 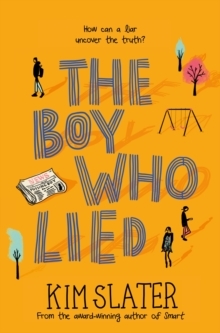 When his younger brother, Sam, goes missing one day, nobody believes Ed when he says he can't remember what happened. He's used to going without, but living without his brother is impossible. With the police and press asking questions and friends turning against the family, Ed is left trying to find Sam with only the help of his new neighbour, Fallon. When the two stumble on a secret that even Ed could never have imagined, it's up to the liar to uncover the truth . . . A sensitive and engaging fourth novel about brotherhood, hardship and being yourself from the multi-award-winning author, Kim Slater.